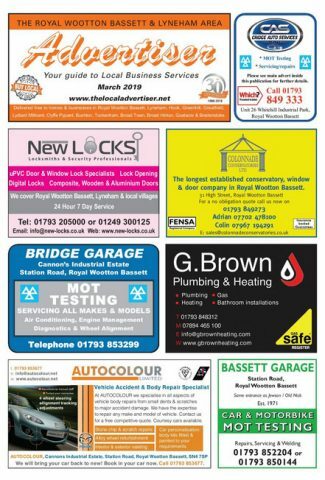 The Local Advertiser - Your Guide to Local Business Services in the Royal Wootton Bassett and Lyneham area. Please note: Due to holiday closures over Christmas, the deadline for submitting adverts to be included in the January edition is 10th December latest. 30 years of serving local businesses. 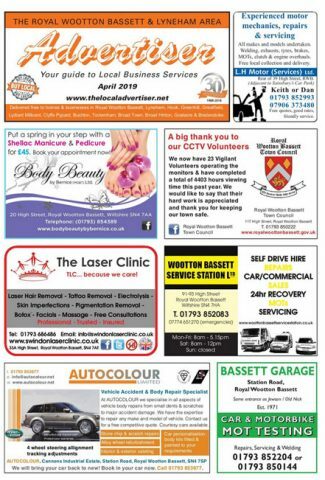 The Advertiser (as it’s fondly referred to) is the longest established advertising publication in the Royal Wootton Bassett and Lyneham area. 2018 marks the 30th year that it’s been delivered directly to homes and businesses. The publication encompasses a host of local services and retailers – from sole traders to national companies – in one compact, easy-to-navigate paper. Using our website, you can browse the latest issue online, read previous issues, submit your ads and more. The Advertiser plays an important role in the local community. Our free listings of non-profit making events help many local organisations gain new members or run events successfully. Residents can advertise their private sale items and at the same time see what our wonderful traders and service providers have to offer. Every month The Advertiser reaches 9,100 homes and businesses, with a further 100 copies distributed at public information points throughout the towns. Local businesses have trusted The Advertiser for a quarter of a century. It remains the most straightforward, cost-effective way of reaching customers in the area. Just look at a recent publication to see how many local traders trust marketing their business with The Advertiser. We know business people are always short on time, so we make submitting your advert as quick and straightforward as possible. We'll even supply you with free artwork! Sally @ The Royal Wootton Basset Advertiser always delivers a PERSONAL PROFESSIONAL service who genuinely CARES for the businesses that she supports in the magazine. Her non-pushy attitude will help the Advertiser be a success for another 20 Years. © 2019 - AD & P Ltd. All rights reserved.